Are large global cities pulling away from their surrounding regions? A recent wave of research and journalism has found that large cities are powering further ahead in the U.S. economy, as smaller communities and rural areas fall further behind. This matters because, as Neil Irwin wrote in The New York Times last month, place-based disparities in growth and opportunity are critical to understanding national economic, and even political, trends. This begs the question: Is America’s prosperity divide globally distinct or a dynamic that extends worldwide? The amount of economic activity generated per person—one proxy for average living standards—remains much higher in large cities than in their surrounding regions (Figure 1). 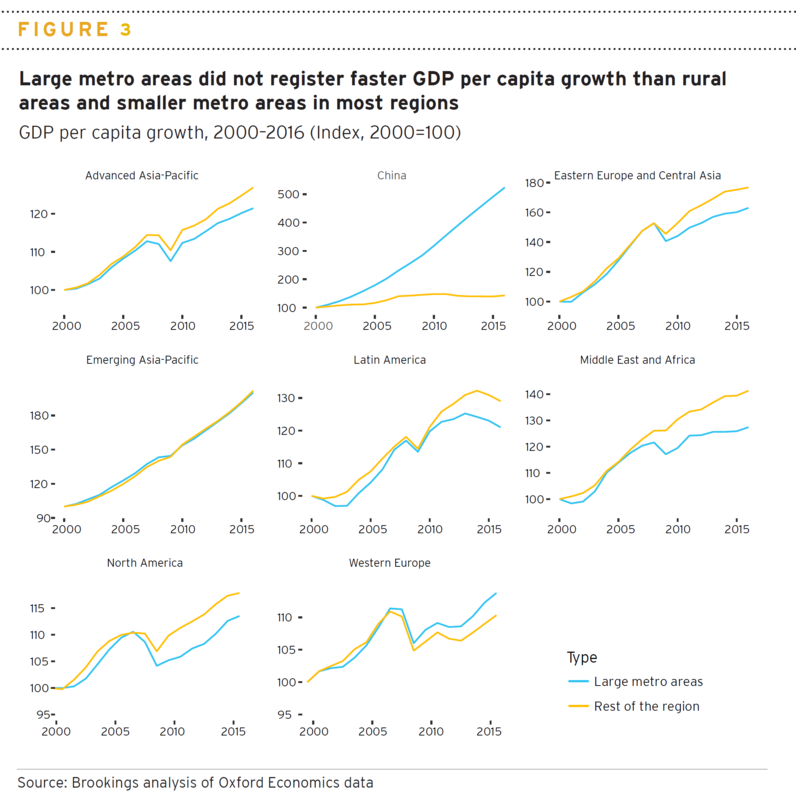 The GDP per capita gap between large metro areas and their surrounding regions remains the largest in emerging markets, not in advanced economies where the political backlash to economic divergence has been most apparent. Among advanced economies, GDP per capita in large metro areas of Advanced Asia-Pacific countries is about 8.5 percent higher than the rest of that region. The large-metro advantage grows to 41 percent in Western Europe and 46 percent in North America. These disparities are not insignificant, but they pale in comparison to the GDP per capita gap in emerging economies, which range from 65 percent in Latin America to nearly 500 percent in China. However, this data snapshot reveals little about change over time. The real question is: Are large metro areas pulling away from the rest of their regions, or are they converging as economic theory predicts? To answer this, we examine growth trends between 2000 and 2016 on two indicators: employment and GDP per capita. During this period, large metro areas have gained jobs faster than smaller cities and rural areas in every region, sometimes dramatically so (Figure 2). Large Chinese metro areas, for instance, experienced 88 percent growth in employment while the rest of the country lost 12 percent of its jobs, due in part to significant workforce migration from rural areas and smaller towns to large metro areas. The gap in employment growth in Advanced Asia-Pacific, Eastern Europe and Central Asia, and the Middle East and Africa is similar, but not as stark. In Western Europe and North America, large metro areas tracked their surrounding regions more closely in the lead-up to the financial crisis, but then pulled ahead of smaller cities and rural areas in the post-recession period. GDP per capita measures, however, tell a different story. Excluding China and Western Europe, rural areas and smaller cities have either surpassed or tracked the growth rates of large metro areas in each region (Figure 3). One reason is that large metro areas in Advanced Asia-Pacific, Eastern Europe and Central Asia, Latin America, the Middle East and Africa, and North America all experienced more significant declines in GDP per capita during the Great Recession and have yet to make up that ground in the post-recession period. China is once again a remarkable outlier, with its large metro areas posting consistently stronger GDP per capita growth than its smaller cities and rural areas. Indeed, large cities are expanding employment faster than their surrounding regions, as evidence of the power of agglomeration in driving economic activity. But GDP per capita trends—a rough proxy for incomes—suggest the gains in jobs and people in large cities has outpaced increases in the output those cities are producing, diluting per capita gains. While by no means definitive, this analysis provides some additional nuance to debates about “large city vs. regional hinterland” from a global perspective, extending analyses that heretofore had mainly focused on the United States. For local leaders, these place-based dynamics demand an understanding of metropolitan economic advantages and weaknesses in a global context with the goal of increasing jobs and incomes, as has been the focus of cities participating in efforts like the Global Cities Initiative. For national leaders, the place age demands a greater focus on sub-national economic trends, as those seem to be increasingly important in shaping national and international policy and politics.